After First Light, Alfredo’s Café was the second fragrance idea we ever came up – and the hardest, by far, to get right (forty-two rejected efforts! ):turns out that tobacco notes need to be balanced with GREAT care. But it was worth it as it’s one of the key fragrances that defines the whole La Montaña brand. For a start, Alfredo’s Café is a real place, it’s our village bar, and café, and restaurant, and Alfredo and his wife Maria Carmen, are the genial owners. The square (more a turn in the road than an actual square) is, of course, the centre of the village, and village life. In the square there is also a little supermarket, one of the village’s two bakeries, and the church. And except for during siesta, and in the dead of night, it is always full of noise: old men slamming down their dominoes, cyclists bellowing for more olives or another beer, it’s where they let off fireworks, and where the bands play during the fiestas, and where kids kick footballs. And it’s full of movement and action: mopeds tear through it, giant trucks full of oranges swing past, perilously close to parked cars, and hundreds of cyclists throng there, like migrating, lycra-clad wildebeest. 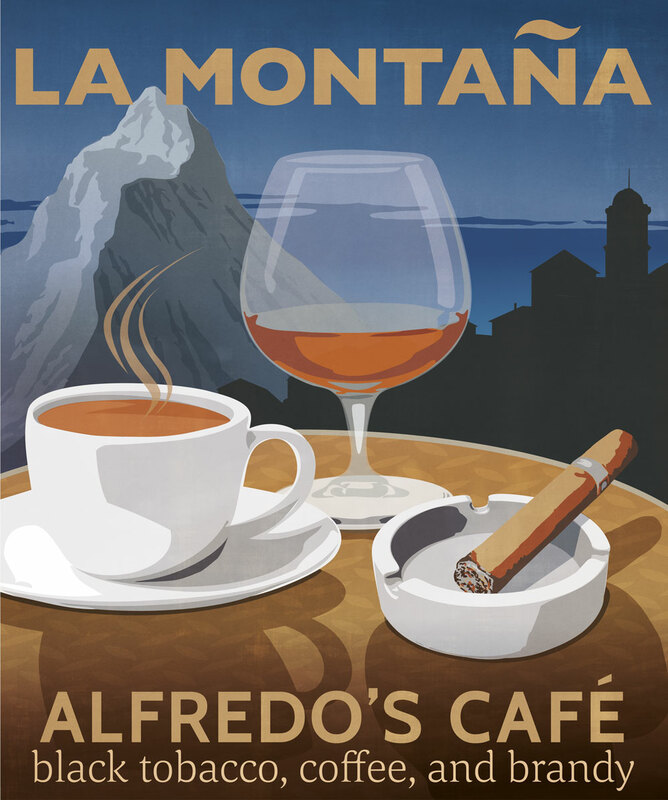 But more than our affection for Alfredo and Maria Carmen, it’s the fragrances in the bar, and in the little village square, that spoke to us; the three key notes in Alfredo’s Café (the candle) are cornerstones of both Cass’s and my early memories of Spain: black tobacco, brandy, and coffee. By the way, we hope the image reminds you of that ever-so-cool, French cigarette brand Gitanes. Coffee, being such a part of Mediterranean life, of course, also had to be an ingredient. Then there’s brandy – often sipped alongside the coffee, as part of a balanced breakfast! And finally, the church. What?! I hear you splutter. Well, it was less of a fragrance note, and more an impression that we wanted to create. And not really of the church itself, but of a dark interior, of leather and wooden pews, and of incense. We liked the idea of something smoky, and spicy, and a little mysterious – it reminded us both of the first time we witnessed the processions during Holy Week (Semana Santa: those spookily juddering Madonnas on the shoulders, seemingly, of the Ku Klux Klan, marching to a funereal drum beat, and the whole street swirling with spicy incense. Alfredo’s Café is in the Fougère family of fragrances, characterized by its sharp herbaceous and woody scent. This candle tends to be bought by women for their partner’s ‘man-cave’ – but very soon gets repossessed and, interestingly, more people ask us when we are going to make Alfredo’s Café into a cologne, than any of our other fragrances.